Gov. Palin appears as tiny figure in center of photo at this distance. The first annual P. U. R. E. Celebration at the Gwinnett Arena in Duluth, Georgia was an evening of praise and worship, followed by an inspiring speech by Governor Sarah Palin. Music by Christian artists was interspersed with short speeches, some by video, by people involved with the P. U. R. E. Ministry Project and by people with special needs family members. 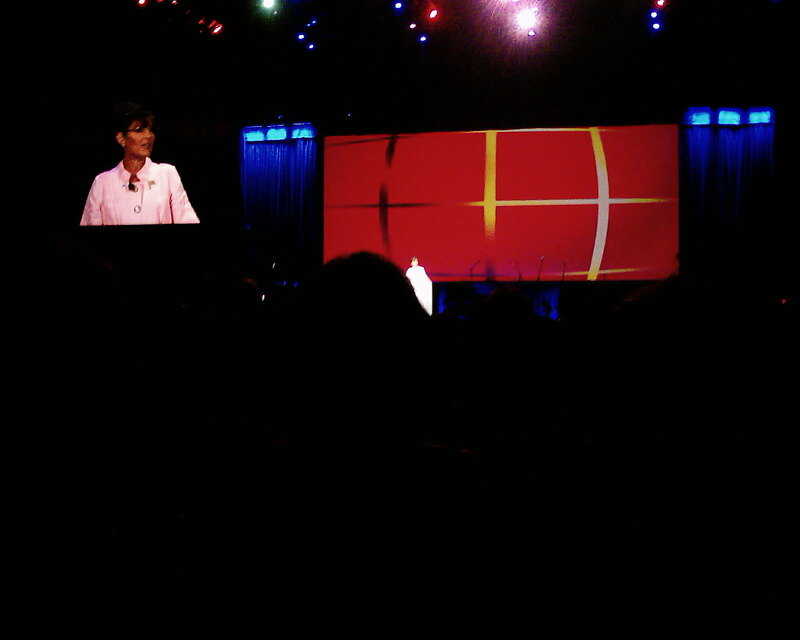 Governor Palin’s speech was heartfelt and oriented towards the special needs community. Music at the beginning of the evening was provided by the choir and by Brent Cochran and other Christian artists from the Blackshear Place Baptist Church in Flowery Branch, Georgia, where David Glover, President and founder of Zachariah’s Way , is an active member. Zachariah’s Way was founded in memory of Glover’s grandson, Zachariah Emerson, a special needs child. Sponsored by Zachariah’s Way, the P. U. R. E. Ministry Project is a “nationwide effort to assist Christians in including, ministering to, and caring for disabled people and their families within the framework of their local church”. The concept is being implemented successfully at Glover’s home church, and the goal of the ministry is to help special needs people and their families become integrated into and ministered to in their local churches. Speaking next, David Glover said that nearly over 50 million people have special needs, and that they are largely forgotten and by and largely not in our churches. He said that churches need to be “informed, encouraged, inspired, excited, and united to celebrate what can be.” Glover said that the ministry wants to expand nationwide and that the P. U. R. E. Celebration will be in Texas next year. Beverly Ragan, David and Adam’s mother, then spoke about her experiences in a racing family and about how involved Adam was with David’s racing team. Adam was wearing the team shirt that was given to him by David Ragan’s Nascar team. On the way out after the event, I saw people having their photos taken with Adam in front of a racing car in the Arena lobby. Kurt and Brenda Warner spoke about their experiences as special needs parents of 21-year-old Zachary. An accident when he was 4 months old left him with brain damage and blindness. Like all the other family members of special needs children who spoke, they talked about what a joy Zachary was to them. Jeff Crook, pastor of Blackshear Place Baptist Church then spoke about how the P. U. R. E. Ministry at Blackshear Place does things for special needs people that “make God smile” and has a ripple effect on special needs families. He said it isn’t rocket science – it’s simply calling the church to be what Jesus wanted it to be. David Glover spoke next and announced that the P. U. R. E. Ministry Project has formed a partnership with Ambucs, which provides mobility equipment for and ramps in the homes of special needs people. He said at the same time they get to share Christ with special needs families. Dave Upton from the Birmingham chapter of Ambucs was there also. 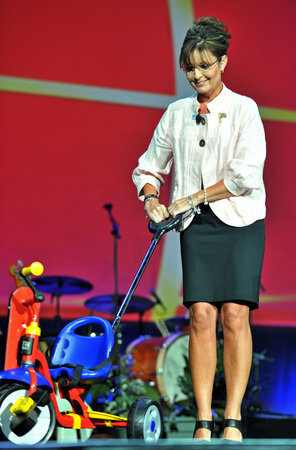 When Governor Palin walked onto the stage, he presented her with a therapeutic tricycle for Trig. Governor Palin seemed delighted and playfully pushed the colorful toy on the stage briefly. Glover said that he was about to burst some bubble. He said that you’ve heard that Sarah Palin was genuine, had integrity, was articulate, a believer, kind, generous, and gracious. He said that she was that and much, much more. He told how genuine and patient she had been in working with their people at the event. As Governor Palin took the stand, the crowd stood to their feet and cheered. They had stood to their feet off and on during the evening as the Christian artists performed, but the response to Governor Palin was the most robust of the evening. Governor Palin said what an honor it was to be here in the Peach State . She recognized the military and veterans who were present and asked them to stand. She thanked them for protecting our country and also recognized first responders in the audience. Governor Palin announced that after she paid her taxes on it, she would be returning her speaking fee to the P. U. R. E. Ministry. She talked about “a couple of the best days of my life” when she attended Track’s graduation from boot camp at Fort Benning, Georgia. She said of the military that they are a source for good throughout the world and there is nothing to apologize for over the United States military. Then she said, “I want to share with you a connection I have with many of you, and that would be my son Trig.” She talked about how we should work to make people a little bit less afraid of people with special needs, a little more comfortable with them, and how we should make our country a more welcoming place for special needs people. She said her sister Heather was the patient, nurturing one, a Mother Teresa and Matha Stewart rolled into one, and she could understand why God would choose her to be a special needs parent. But she said she felt God was preparing her own heart during the pregnancy, which she did not announce until she was 7 months pregnant. Governor Palin said there are the world’s standards of perfection, and then there are God’s. She said that every child is beautiful before God and dear to him, that they not a burden but a blessing. She said that they have a unique place in God’s divine plan. She said that it breaks her heart to see how some people refer to special needs people. She criticized the “vernacular slang coming out of the White House” in which people were called “retarded.” She said America is too good to have to put up with that. Next she talked about the U in the P. U. R. E. acronym – “Unique in his or her own gifts, blessings, talents, and desires.” She said that she didn’t know anyone with perfect kids. She said that Trig’s challenges are more unique than those of his siblings, and that he has a unique destiny. She said that we need to make the world a more welcoming place and open people’s eyes and hearts. She said that the unifier is going to be God as society struggles to find a proper place for special needs people. She said that special needs people might not win a Nobel Prize, but that Nobel Prizes weren’t what they used to be. The latter remark was met with loud applause. She said that changes in society, especially Obamacare, are going to hurt the special needs community. She said that as insurance premium prices go up, that it will hurt the special needs community in particular. She said that many special needs families rely on FSAs (flex savings accounts). The new cap on those accounts will impose a tax increase of $13. billion dollars on the special needs community. She said that with Obamacare, there will be fewer providers, fewer choices, increased enrollees and as a result, rationing of care. She said that faceless panels of bureaucrats would be making decisions about who would get care. She said there was some sneaky sliding in of abortion servies, and to keep your eyes and ears open for these. She said that we have to stand up for what is right and walk the walk. 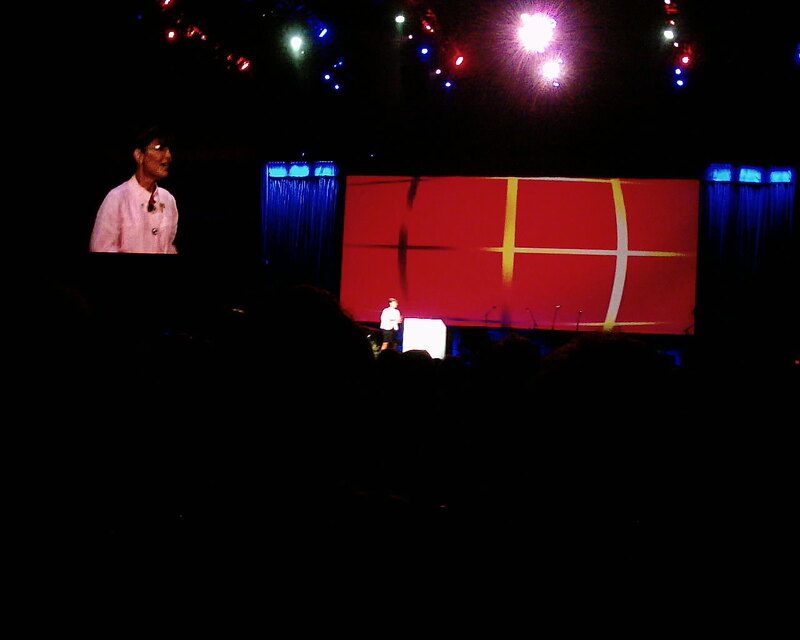 She talked about God being our guiding light, our GPS system. She said that in Alaska they refer to the North Star a lot. She said that they stay speak of being focused on the North Star (God). She said that for Trig, like many other special needs people, his hands serve as his GPS, his safety zone. She described an incident in Texas where he was afraid to cross a lawn to see some puppies playing on the other side. She said he would look at his hand and take a step forward, look at his hand and take another step. She then remarked, “I use my hand as a poor man’s teleprompter” and held up her left hand, on which she had written with a marker. I’m only guessing, but I wouldn’t be surprised if she had Perfectly created, Unique, Receptive, and Eternal written there. Governor Palin said that Trig helps her family keep things in perspective. He helps them realize that the nonsense and distractions are not what is important at the end of the day. She said that Trig is the best thing that ever happened in their lives. She described how Track wrestles with Trig and they play until Trig taps out. She said that Track came back from Iraq “big, buff, and tough” and that he participates in jujitsu, from which he sometimes comes back a little bruised. She described how one night Trig turned an elbow to Track’s nose that caused her big, buff son to tap out for the first time. She said that Trig has not spoken his first word yet, but that she is rooting for “Mama”. He also has not eaten solid food yet and she is waiting for him to have a Cheerio. She said that his slower development had been more than made up for by the actions of his little heart of gold teaching the family how to take one day at a time. She said that we all have a cross to bear, and that special needs people may have more struggles, but we should still rejoice and be glad. She said that when Trig wakes up every morning, he rubs his eyes to get the blurriness out, looks around, and starts applauding. She said he welcomes each day with applause and giggles. She said some days are better than others, but that he applauds them anyway. Governor Palin mentioned Matthew 18 and said that God does not fail in his promises. She said that we should show mercy to others and trust Him on it. She said that in Paul’s second letter to the Corinthians, he said, “For our light affliction, which is but for a moment, is working for us a far more exceeding and eternal weight of glory.” She said the physical struggles that special needs people face are temporary, but their spirits are eternal. She said these are momentary light afflictions, and not God’s eternal reality. She said that special needs people, with their hearts of gold, are more precious to God, because they are more in touch. The crowd stood to their feet and cheered as Governor Palin, waving in her characteristic way, walked to the back of the stage and exited, still waving. As David Glover took the podium to make the closing remarks, his first word was, “WOW!” He told how they had asked Governor Palin to be the official P.U.R.E. ministry ambassador and that she had graciously accepted He also commented on how friendly she had been to the folks dealing with her. He thanked the churches and individuals who had participated in the night’s event. He said the ministry’s goal is to grow 50 new ministries in the metro Atlanta area over the next year. They have 4 training seminars planned in the next 4 months for people who are interested. Glover estimated the crowd size of the event at 1000 people. He announced that Chris Tomlin would follow with the song “We Will Rise,” and asked the audience if they would rise to the challenge presented to them. He encouraged them to extend their comfort zone to understand P.U.R.E. people and their families. Heidi Rew gave the last remarks and asked again that those who would like to contribute to the P.U.R.E. Ministry text 27138 and type in PURE followed by the amount they wished to contribute – for example, “PURE100”. This entry was posted on June 30, 2010 at 1:31 PM	and is filed under Uncategorized. You can follow any responses to this entry through the RSS 2.0 feed. You can leave a response, or trackback from your own site. Awesome writeup, Fay! I attended the celebration and yours is the most complete and best writeup I’ve read about it. I also want to add that Sarah stated how she deals with the attacks against her and her family is “God is my shield.” She also joked about the fact that the celebration was held in the hockey arena (Arena at Gwinnett), and jokingly addressed us as “y’all.” All in all, she gave a very, very good speech! Thank you, Laurie. Yes, I was thinking yesterday about what she said about the importance of her prayer shield. She knows where her strength comes from and appreciates those who uphold her in prayer. There was a lot more to her speech that I would have liked to include, but I worked from notes scribbled hastily in the dark to semi-dark. The content and delivery of her speech was excellent. It was well-organized around the meaning of the letters of the P. U. R. E. acronym. Her appearance was also impeccable. It amazes me that she can be so feminine and strong and tough at the same time.